Even the most discriminating will be wowed by this stylish serving tray featuring two fine California wines. 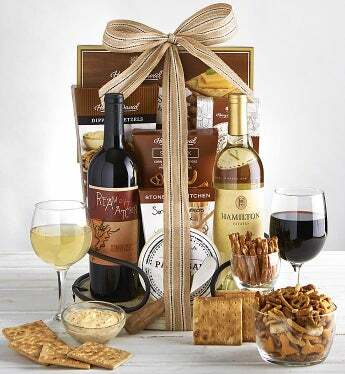 Complete the party with Parmesan Herb Spreadable Cheese, Stonewall Kitchen® Sun Dried Tomato Dip Mix, Harry & David® Super Snack Mix, Almond French Twists, Dipping Pretzels, and more. Mendoza is the heart of Argentina's wine industry and that heart pumps the world's finest Malbec all around the globe. Produced with great care, this big and bold Malbec is as ripe, rich, and round as it could possibly be. The 2017 offers classic blackberry and cassis aromas over black cherry and fresh pomegranate flavors with just a hint of smoke. A clean and elegantly structured wine that over delivers and rivals the finest Napa reds. Hamilton 2017 Sauvignon Blanc Wine This intriguing California Sauvignon Blanc is light and refreshing and perfect with chicken, pastas, and seafood. The wine colour is very pale straw with bright green hints. On the nose it shows strong aromas of fresh tropical fruits. The palate is soft and displays vibrant flavours of passion fruit, pineapple and citrus. The wine finishes with a clean and crisp lingering acidity.